Using a fly as a bait fish is the easiest way to catch a big fish on a streamer. The fly behaves like a small fish and if you use it correctly it behaves like a wounded small fish so the big fish thinks that his meal just arrived. You can let the fly drift in the current and in this way the fly looks like a swimming fish, the perfect baitfish. Using a streamer in a place where there is current while pulling back the rod from time to time, makes the fly imitate a wounded small fish that hoping up and down which is a perfect bait for bigger fishes that are ready to hunt it. Matching the fly to the target fish that you want to catch and the place you are planning to fish will influence on your fishing success. The targeted fish means that you want to match the fly that imitates best the baitfish that your target fish is looking for. You would like to match the right size of the fly since the odds are in favor for the bigger the fly the bigger the fish to be caught. Another thing that you want to match or consider is the size of your rod. If you are planning to catch big streamers then you will need a big rod. 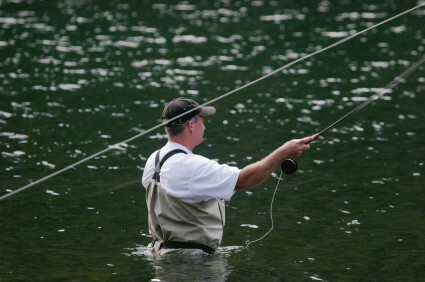 When fishing in standing still water like in a lake, the farther you can cast the more likely you will catch a fish. This is due to the fact that in moving water with a natural current the fly swims just because the stream move it all the time and in standing still water you have to pull back the rod and play with it in order to give it a moving look. When you cast it far then you have the ability to retrieve the fly and make it look like a swimming baitfish.